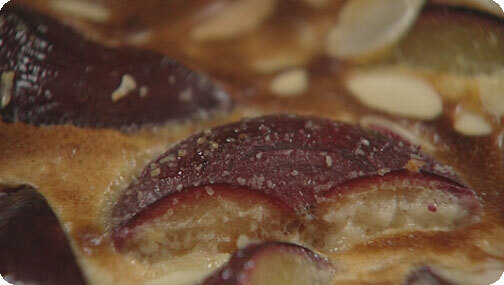 Based on this revised recipe – plumb clafoutis is 288kcals and 11.3g of fat/ serving. Wash, halve and stone the plums. Place the plums, amaretto and brown sugar in the bottom of the dish and mix together. Make the batter: using the remaining ingredients except the flaked almonds Whizz all the batter ingredients in a blender until smooth, pour it over the fruits, sprinkle over the flaked almonds and then bake for 30-45 mins, until risen and golden brown. Serve warm.